Value for money, affordability and risk are without question the current watch words for our sector, and they are inextricably linked, and at the heart of all decisions about future service direction, from kerbside collections and recyclate processing, to residual treatment. These watch words featured heavily in the discussion during a recent CIWM webinar, from earlier this week, which SUEZ sponsored, on procuring appropriate and sustainable waste management services. Chris Murphy, deputy CEO of CIWM chaired and I was fortunate to be joined on the panel by Dan Roberts from South Staffordshire District Council (and LARAC) and Sarahjane Widdowson from Ricardo, who have authored a new toolkit designed to help local authorities prepare for potential future service procurement. Over 80% of the delegates attending were due to go out to market in the next three years and judging by the questions asked are already trying to address these themes head-on. This is heartening, but there are many more authorities out there that weren’t on the webinar and who may decide to procure some or all of their waste services in the near future, and that is the reason that SUEZ sponsored Ricardo to develop the toolkit, to help share both consultant and contractor views about what makes a good procurement and what trends and issues officers should be aware of that could impact on the quality of the submissions and the interest of the market. For authorities contemplating the “what next” question there are a number of often competing issues that need to be considered before either going to market or taking the decision that the best value route may be to internalise service delivery. Decisions on what might be the right solution locally must also take into consideration the regional dimension (including possible partners and capacity), the national dimension (with current, and future policy and targets) and the international dimension (in particular the impact of leaving the EU on policy and commodity markets). Making the right decision for your local area (district, borough, partnership, county etc) will require officers to really think about our global system of materials and resources irrespective of what service they intend procuring and / or delivering. So, what were the key messages from the discussions? Having a good understanding of what you want to achieve is vital when considering whether the service is value for money and this means doing some analysis up front. An options appraisal can help you to fine tune exactly what you want and what performance you expect your service to achieve whether it’s a high recycling rate, clean streets or a widely accessible HWRC network. Decisions on value for money can then be evidenced and aligned with local priorities, and benchmarked against neighbouring authorities, and industry best practice etc. Value for money also means comparing ‘apples with apples’ so ensure assumptions, service design and general definitions are consistent when comparing like for like, whether it be recycling target and frequency of collection, or the potential to outsource or insource a service. The private sector fully appreciate that Local Authorities are still under significant financial pressure and will continue to be for at least a few more years, after all we have been working with you through austerity, adapting services to save money, and looking at ways of delivering potential commercial income share or reducing unnecessary costs (from contaminated loads etc.). This financial pressure will often result in a decision on ‘what’s affordable’, but that isn’t always the best indicator or measure. When considering what your authority might be able to afford you must also take into consideration what it will cost you to not implement change, for example a lack of investment in recycling services and associated communications in the short term can mean stagnating recycling rates and low public perception which can result in declining participation and rising contamination levels. This could result in the service on offer being unaffordable both politically and financially. The private sector understands the financial pressures that local authorities are subject to and we are actively working with many of our clients to identify potential savings from service changes and innovation, from quality inputs to our MRFs to reduce processing costs and end market rejects, to reduced residual waste capacity and collection frequency to drive greater segregation etc. Talking to the market about your situation can open up opportunities, but you must do this early so you can factor it into any planned procurement, and to enable a true value for money assessment to be conducted. The key with risk is understanding what it is, who has responsibility for it (or who is best placed to do so) and what can be done to mitigate it. Early planning and engagement both internally and externally can help with this, as can sharing experiences with other authorities who have recently competed their procurements (what lessons could we learn?). Staying abreast of sector changes, policy developments and new risks (and opportunities) is key to ensuring your procurement hits the right spots, is considered attractive by the private sector, and generates the kind of commercial interests that not only drives the price down, but also allows prices to be sensible, with the private sector only taking on responsibility for the risks they can control (so not the global commodity market!). The new CIWM member’s quarterly policy update would be a good starting point for staying abreast of the bigger issues. Your contract management team should also be feeding in to the process to ensure that current practices and procedures are identified and understood, and any necessary improvements or changes are tabled early. External market engagement will definitely help you to understand what the private sector will accept and what is unpalatable to them. Risk can often be about control (both perceived and actual) and if you expect a 90% of your recyclables to reach end markets, yet you allow yourself up to 30% contamination of MRF feedstocks then the ability of the contractor to influence this is limited and as such the risk would be considered high – which is why many contractors are now kicking back on these types of clause (and those that pass all commodity risk to the private sector). Although there are many challenges ahead, I have often seen in my 20 plus years in the sector that challenge drives opportunity, and enables us to think differently and to innovate. We (the private sector, and SUEZ in particular) will continue to do this with our Local Authority partners and I’m sure that we’ll see new and exciting ways to procure and deliver services in the future, as we are forced to re-evaluate old models and processes. Procurement will be an on-going hot topic for the next few years particularly with the dynamic state of the market. SUEZ has recognised the challenges that local authorities are facing, and for several years have been contributing think pieces, case studies, and insight reports to help stimulate the debate and move the sector forward. Our latest contribution has been to sponsor both the aforementioned webinar and the development of an independent procurement toolkit for waste management services (by Ricardo Energy & Environment). 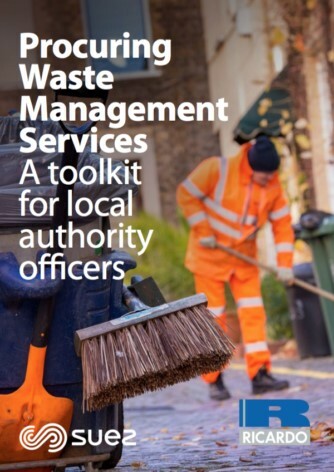 I hope you find it useful, and I look forward to continuing the debate at regional CIWM meetings in the coming months. The toolkit is available to download here: https://ee.ricardo.com/procuringwms and you can also download a recording of our webinar here. As with all my ‘comments’ they are mine and mine alone. If you would like to get in touch or comment on my thoughts then please do so, I am more than open to some good sold fashioned debate and dialogue. Please email me on adam.read@suez.com. This blog was originally published on https://ciwm-journal.co.uk/on 09 May 2018.